We have been so lazy lately. This morning we lolled around in the bed until almost 10am. I don't remember the last time we did that....although maybe it was yesterday. But hey- we're on vacation! We awakened to the snow that had fallen last night, and the flakes still coming down. I made potato pancakes with the leftovers from last night's dinner (see this post for the recipe). Then we sat at the table, talking and drinking our beverages (Dev had his coffee and I had my new yerba mate tea) for quite a long time. I went to the library yesterday and scored several really good books to read. I checked out "Like Water For Chocolate," "Small Wonder," and "Dress Your Family in Corduroy and Denim." I am especially anxious to read the Kingsolver and the Sedaris. I love both of these authors. I will try to remember to post some thoughts about the books as I finish them. I got about a quarter of the way through "Small Wonders" last night. My Daddy sent me some Christmas money, so instead of being responsible and paying bills with it, I decided to buy books. Actually, that's not really accurate. I used Daddy's money to join the Rec Center so I could get some exersize and get back to my yoga class. But that freed up some money in my budget to blow on books. I have discovered half.com. My wish list on that site is about a mile long. Everytime I read a food or knitting blog that mentions a book I might want, I go over and find it and slap it on the wish list. With my new found money, I ordered 4 books off my wishlist, and I bought one for Dev. He has been wanting "The Physics of Superheroes" for quite a while, and I found it for pretty cheap. Anyhoo, the first of my books arrived yesterday. 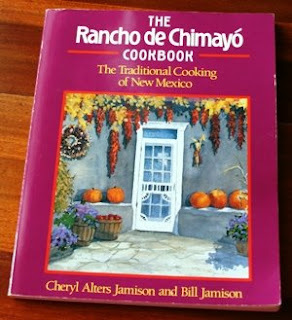 I ordered the "Rancho de Chimayo Cookbook." The restaurant (Rancho de Chimayo) is not far from where I live. I've never been but I've heard wonderful things about it. I checked this book out from the college library a while back and loved everything about it. It is really more a history book than a cook book, although it does give all the recipes for the salsas they use, as well as meat preparations. I'll be sure to make something out of it and post it here soon. Aww - the snow sounds awesome - its been so warm here lately!